Asian inspired styling gives this top a round shape, shorter length, and a sweetness that is like a breath of spring air to the fashion senses. Crossover cut, novelty pockets and short sleeves. Back drawstring provides shape and fit, while matching ribbon detail in front adds a special touch. Center back length: 27". Subtle embroidery that is impossible not to notice adorns the softly rounded collar on this charming short sleeve button front top. The shapely fit, princess seams, two front pockets and tiny pleats at the top of the sleeves turn this into a "dressing up for work" kind of top. Center back length: 27". Crispy elegant traditional nurse wear is a classic staple. Princess cut fitted top features angled pockets, a lapel collar that lies flat in the neatest way and buttoned back belt detailing that creates soft shirring. Five button front closure and stitched seams throughout. Center back length: 27". For the times you need to look crisp, efficient and professional. This princess cut, fitted top has two angled pockets, five buttons down, a lapel collar that lies flat in the neatest way and lovely back belt detailing. Tiny pleats at the shoulder of the slim short sleeves add a tailored touch. Center back length: 27". Men's fit, short sleeved front-zippered jacket features front yoke, two patch pockets and chest pocket with pen divider. Back details include a narrow midriff and a couple of crisp pleats. Center back length: 29½". Add some feminine flare to your wardrobe without sacrificing utility - this crisply tailored lab coat provides a trendy touch to your everyday workwear. 3-button front closure offers extra coverage, with multi layered patch pockets and bonus interior pockets for enhanced function. Back midriff with multiple buttons and bungee loops provide an adjustable fit for comfort and style. Center back length: 32". Keep yourself protected in the colors that best express your personal style - full front and back bib offers maximum coverage, with side ties and deep front pockets for the utility that you need. Center back length: 27¼". The ideal lab coat for the 21st Century medical professional - five pockets store everything you need during the day, with a pocket large enough to carry a 10.25" h. x 8.75" w. tablet. Larger patch pockets include buttoned inner pockets for extra security, plus two additional inside patch pockets for even more storage. Center back length: 31". This long, unisex lab coat with five-button front closure offers extra coverage for enhanced protection. Two large lower patch pockets, one chest pocket with pen divider, and two extra inner pockets provide plenty of storage for pens, notepads, cellphones, and more. Walking slits and side hand vents offer easy access with the mobility you need. Center back length: 39". Unisex fit, natural-rise, tapered leg drawstring pants get an update in the form of extra pockets and tonal double stitching at the seams. Double patch pockets are on right leg and single patch on left. Two roomy back hip pockets and tonal twill tape drawstring maintain the classic look and feel. Regular inseam: 31". Unisex fit, natural-rise, tapered leg pants. It's a modern version of a longstanding tradition. Features right leg patch pocket, back hip pocket and flat woven tape drawstring. Regular inseam: 31". Petite inseam: 28½". Tall inseam: 33½". 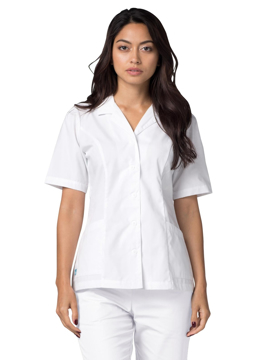 Give yourself some cool comfort and added movement with short sleeved consultation coat. 3-button front closure with one breast pocket and two angled lower pockets offer the utility you need with the extra mobility of a short sleeved jacket. Center back length: 31". Shaped with an adjustable belt for a customizable fit, this lab coat is ready to go anywhere with you. Complete with multiple-sized pockets and 4-button front closure for practical use and enhanced comfort. Center back length: 33". A trendy top with wine glass opening, contemporary fit, and four total curved pockets give this top its name; glamour. With added princess seams to complete this marvelous look ready to make you stand out among the crowd. As always finished off with our comfort tagless neck and side slits for easy mobility, the glamour top is sure to be a must add to your uniform collection. Center back length: 26". A mock wrap taken to new heights with two wide double wraps and double stitched seaming throughout the top. Styled with our contemporary fit, and trendy cut-in pockets, with an adjustable back drawstring to create the extra fitting needed. Center back length: 26½". Classic fit, flare leg pants with contemporary natural-rise styling features a drawstring closure, comfort elastic back, slash pockets and side vents at the bottom of the legs. Regular inseam: 30½". A luxurious take on a classic tee - jersey knit long sleeved crew neck tee, compete with beautiful tonal stitching and silky finish for unparalleled softness and comfort. Center back length: 26". Classic fit, low-rise, straight leg pants, sturdy tape drawstring pants with a soft elastic waist features a contemporary fit. Two front patch pockets, a jump ring on the left pocket, an extra cargo pocket and one scissor pocket on right leg, split seaming details at the knee, five belt loops and double needle top stitching complete this lovely pant. Regular inseam: 31". Petite inseam: 28½". Tall inseam: 33½". Classic fit, natural-rise, tapered leg cargo pants. Features wide comfort all around elastic waistband, multiple patch pocket grouping on right and single patch pocket on left leg. Regular inseam: 30". Petite inseam: 27½". Tall inseam: 32½". This consultation coat provides the coverage you need with the fashion you want - four-button front closure, front and back princess seams with back belt detail, and two roomy patch pockets after utility and a rounded lapel provides a touch of feminine flare. Center back length: 30". 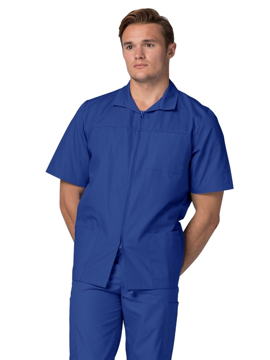 Spiff up a simple pair of scrubs or get an extra layer against the air conditioning. Our round neck warm-up jacket is roomy enough to fit comfortably over scrubs, yet look sleek and put together worn over a t-shirt. Stitched neckline, four snap-front closure and knit cuffs. Center back length: 28½". 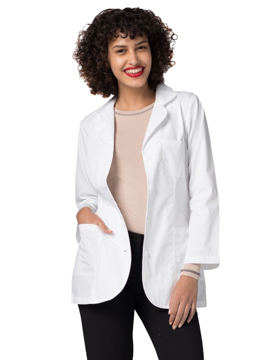 This slim-cut lab coat gives you the fit you want without compromising practicality - back princess seams, back tab belt detail and five-button front closure provide added utility with a slim and stylish silhouette. Features two patch pockets, two diagonal pockets, and one chest pocket with pen divider. Center back length: 26". Whether you're making rounds at the hospital or seeing patients at your private practice, this stylish, tailored consultation coat adds a touch of professional flare to medical uniforms or an everyday blouse. 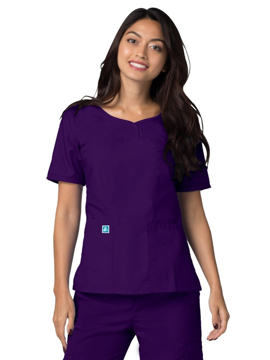 Features 3-button front closures, attached narrow back midriff belt, and curved patch pockets for reliability, comfort, and style. Center back length: 28". A classic tee goes with everything and never goes out of style. Basic long-sleeve crew with 1"x1' rib knit collar and double-needle stitched hem. Medium length 26½"
This v-neck top features four pockets with chest pocket at yoke, and large front patch pockets, tradesmen pocket at lower front pockets, bi-swing at back yoke, tagless label at inner back yoke, and side vents at hem. Center back length: 30¾".